Have you noticed? More than ever, we’re snacking during the day. 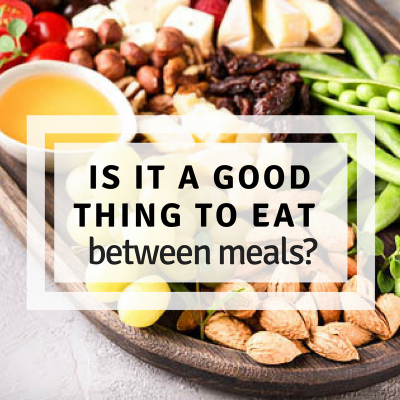 Instead of eating heavy meals, we seem to prefer lighter meals combined with frequent snacks. Mind you, I have nothing against snacking per se. Actually, I’m all for snacking. However, it’s not for everyone, nor is it a good idea to snack every day. Here’s why. Many people experience hunger and a dip in energy between meals, both of which are good reasons to snack. Therefore, the challenge is not to think of snacks as a daily necessity. Appetite varies from day to day, based on the composition of our meals and our activities, which determines the need for a snack. Just because it’s break time doesn’t automatically mean you should eat something! Eating an apple at 3:00 p.m. when you aren’t hungry will end up as surplus calories and excess weight. So, snacks aren’t mandatory. Some people function perfectly well on three meals a day. Did you know that 41% of food consumed between meals falls into the category of “other foods”? Almost half the time when we grab something to nibble, we choose foods that are high in calories, sugar or fats (e.g. cookies, chewy granola bars and store-bought muffins, chocolates, chips, soft drinks). It’s almost as if we see ourselves as invulnerable superheroes in the face of the very real, detrimental effects these ultra-processed foods have on our health (e.g., weight gain, diabetes, high cholesterol, high blood pressure). Fresh fruits and vegetables, yogurt, eggs, nuts and seeds are excellent snack food choices. Popular snack foods like muffins and cereal bars are much healthier when they’re homemade. Unfortunately, commercial versions have little nutritional value. Proteins increase our feeling of fullness and keep us satisfied longer than the carbohydrates in fruit and vegetable juices. If you need to wait several hours before your next meal because you need to take your child to basketball practice after school, then include proteins in your snack (e.g. Greek yogurt, roasted soybeans, a boiled egg or a small can of tuna). If the aim is to curb your appetite a bit while waiting for your next meal, proteins aren’t necessary. A snack solely comprised of carbohydrates and fibre should satisfy you completely (e.g., freshly-cut veggies, fresh fruit, nutritious crackers). When it comes to snacking, always keep two things in mind: appetite and high-quality food. Listen to your body. And when you need a snack, choose nutritious and delicious foods. Your body will thank you!